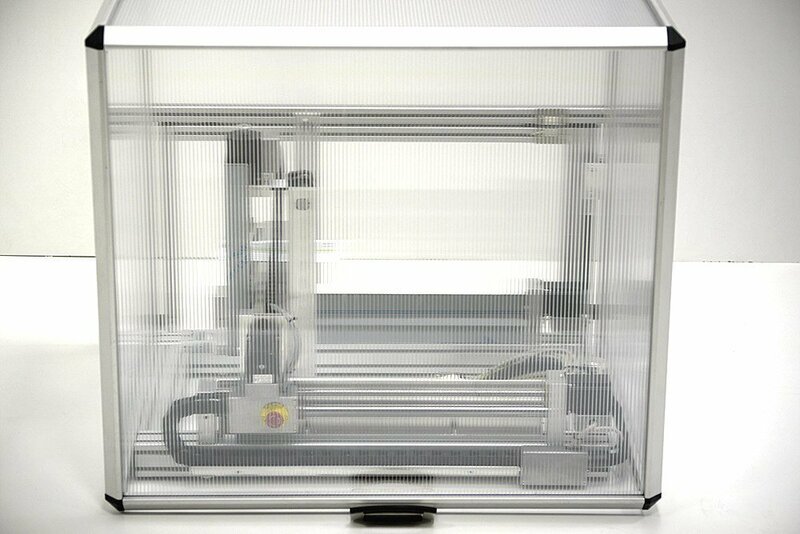 The new hinged enclosure for the High-Z machines series offers even “double-glazed” windows all around, despite a favorable price level. These special polycarbonate panels are 6mm thick, providing the best possible protection against flying chips, breaking tools and noise. 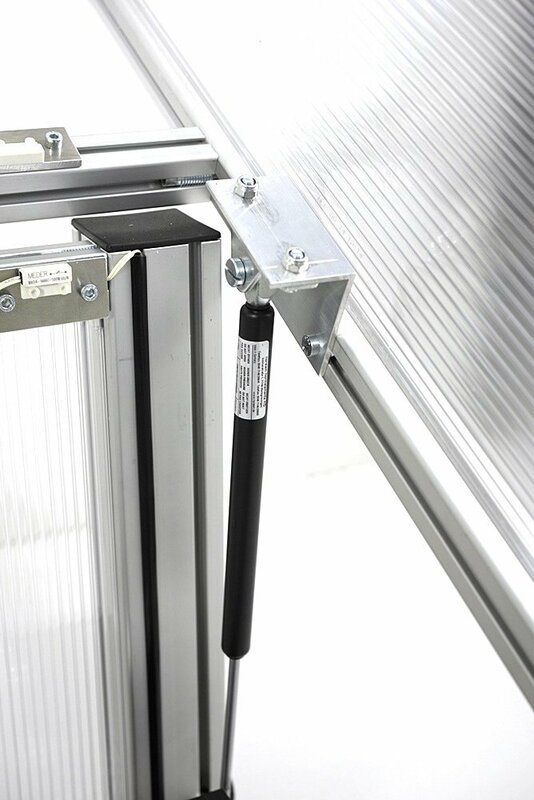 Due to the built-in gas spring, the safety enclosure is opened and closed without any effort. 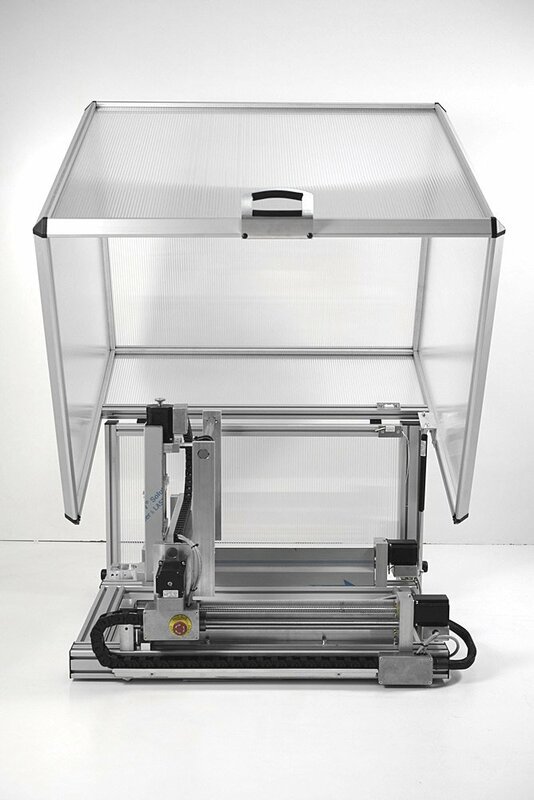 The gas pressure damper supports the enclosure exactly at the right moment of the opening and thus ensures an extremely easy-to-operate and secure operation. 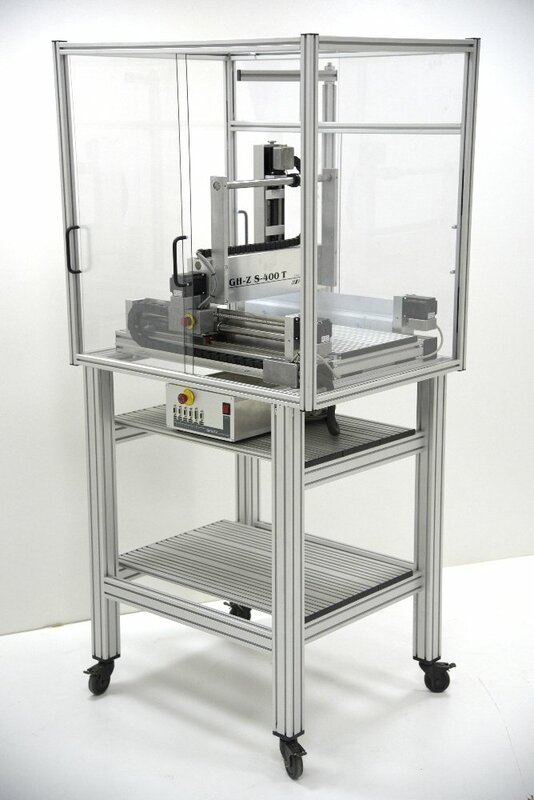 All High-Z machine – housings of this type are equipped with a contactless reed sensor as a safety switch which, in the event of opening during the operation of the milling machine, immediately transmits the signal to the CNC control and switches off the machine completely, including the running spindle it then can only be operated in manual mode (settings must be set in the milling software). 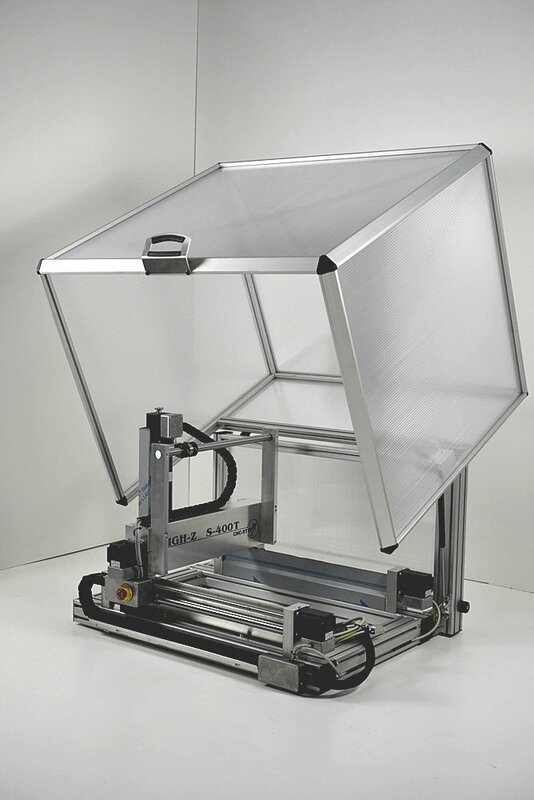 The safety enclosure with the gas dampers is ideally suited if you want to place the CNC milling machine on an 80-90 cm high workbench or other work surface. 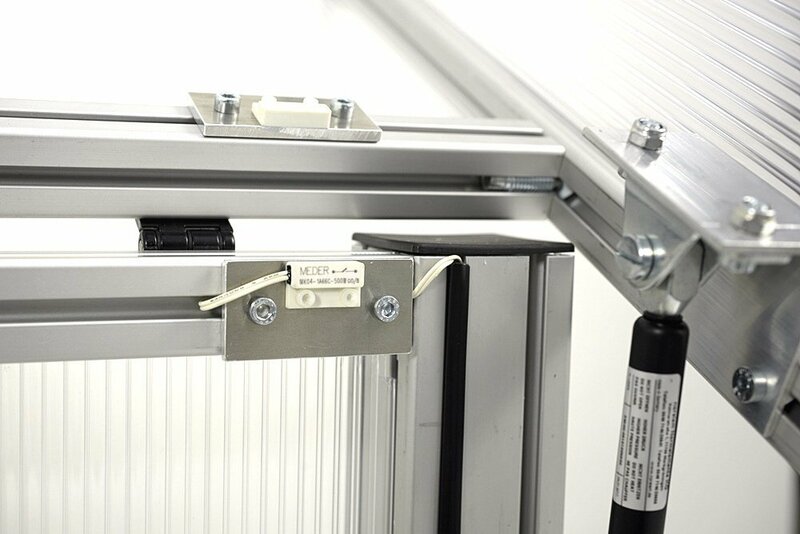 The cable can be discharged directly downwards through the table or through the feedthrough provided in the fixed rear part at the lower right. 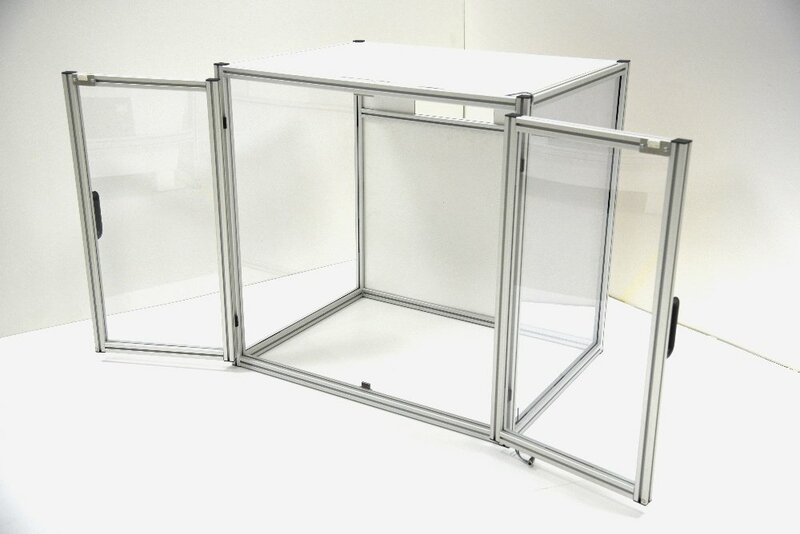 As an option, we also offer you the safety enclosure with a completely transparent single-pane polycarbonate pane. 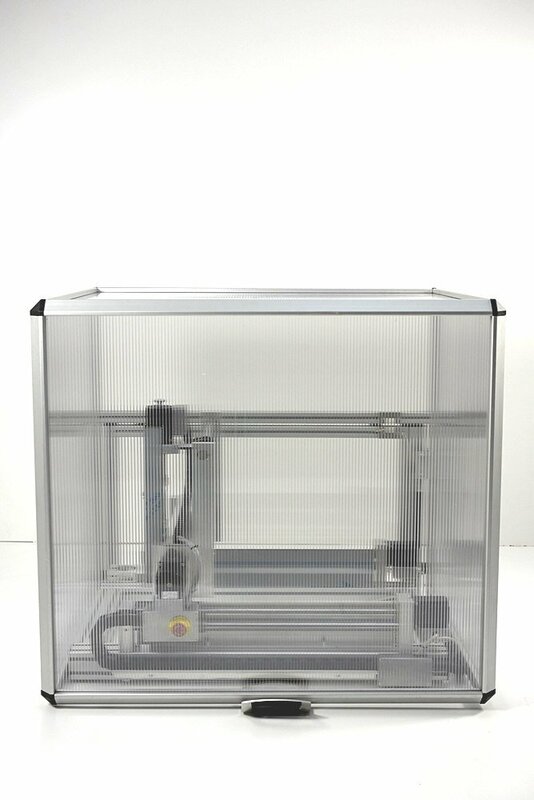 Of course, other shapes and variants of enclosures and supports are also available. We also offer individual bases, with or without wheels. 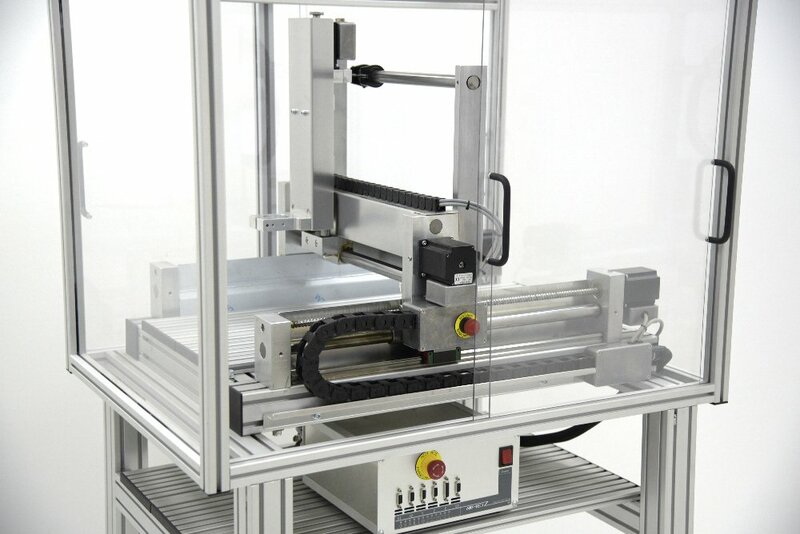 Do you need additional compartments under the machine or drawers? With a customized underfloor you can implement a number of ideas. 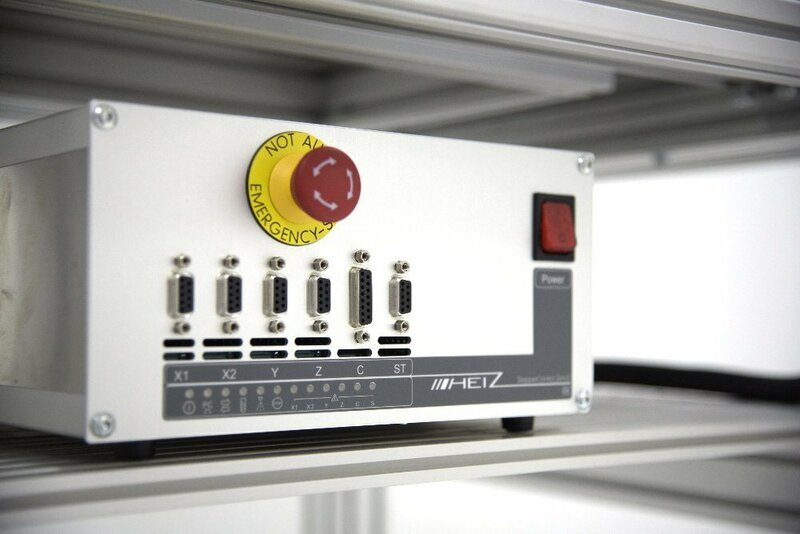 An additional level to be able to clamp and process high workpieces such as Rittal control cabinets? We would also be happy to tailor these options for you individually. Just ask. The example below shows a version with folding doors, which are hung on hinges. We can tailor the desired enclosure with the base as you wish. This also includes additional compartments or doors, storage rooms, shelves. So that you can work efficiently and safely with your CNC milling machine and everything can be found in its right place. 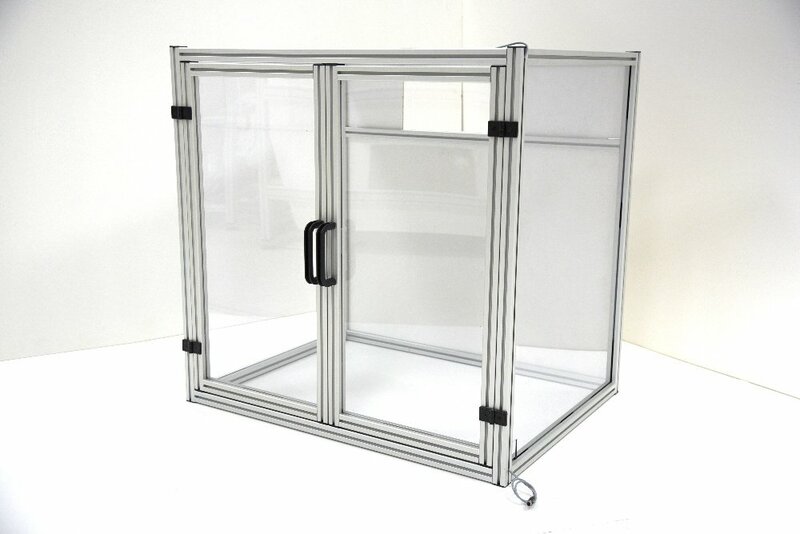 A safety enclosure should always be an integral part of the CNC system, since surrounding chips do not only cause dirt outside the CNC machine, but they can also cause damage to the health (eg chips in eye etc.). Tools can break and fly. 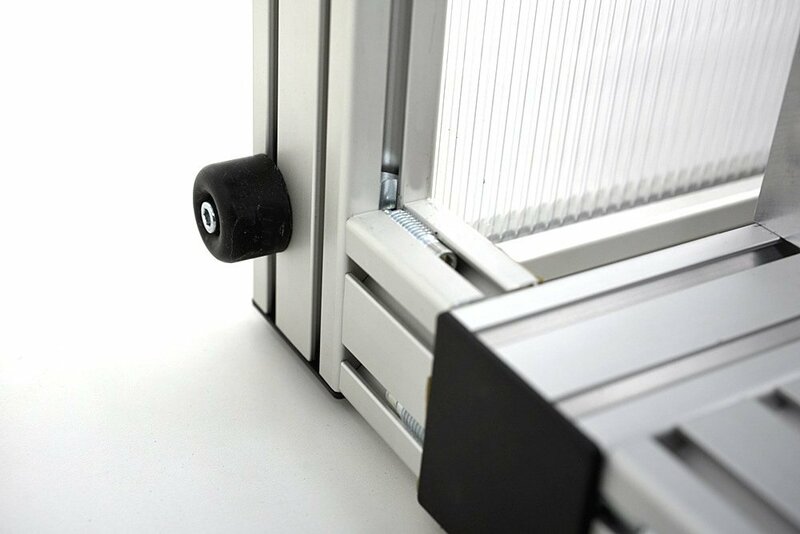 In addition, each enclosure is an additional plus in terms of noise protection. Here, the dB value can be controlled by 10-15 dB, depending on the system and enclosure used. In the industry and trade and schools duty! 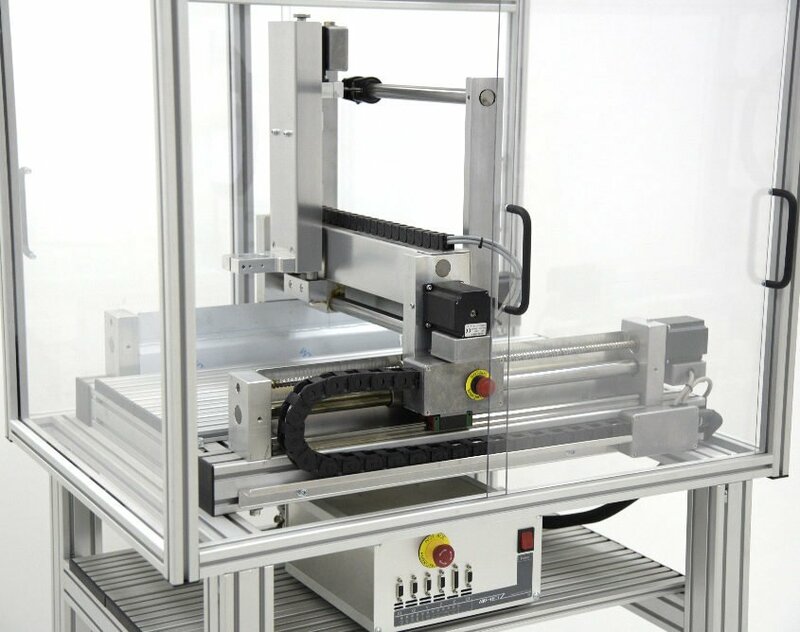 When our machines are asked for commercial, industrial or school needs, an enclosure with a corresponding safety shutdown is always included in the offer, since no system can be operated without this additional safety. 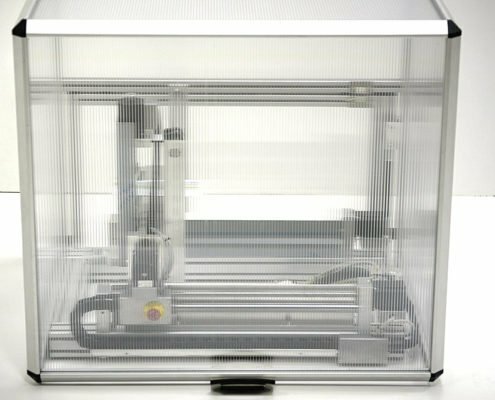 At the very latest when the CNC milling machine is viewed by the professional association in your company, problems can arise which at least lead to a temporary decommissioning of the CNC milling machine up to the addition of the corresponding enclosure. In addition, we are obliged to point out to all customers the possibility of security. We are obliged to comply with this obligation on the website as well as in our communication with the customer before placing an order.